The fossilized remains of Mansourasaurus were unearthed by an expedition undertaken by the Mansoura University Vertebrate Paleontology (MUVP) initiative, an effort led by Dr. Hesham Sallam of the Department of Geology at Mansoura University in Mansoura, Egypt. Sallam is the lead author of the paper published today in the journal Nature Ecology and Evolution that names the new species. The field team included several of his students, many of whom—Ms. Iman El-Dawoudi, Ms. Sanaa El-Sayed, and Mrs. Sara Saber—also participated in the study of the new dinosaur. The creature's name honors both Mansoura University and Ms. Mona Shahin for her integral role in developing the MUVP. According to Sallam, "The discovery and extraction of Mansourasaurus was such an amazing experience for the MUVP team. 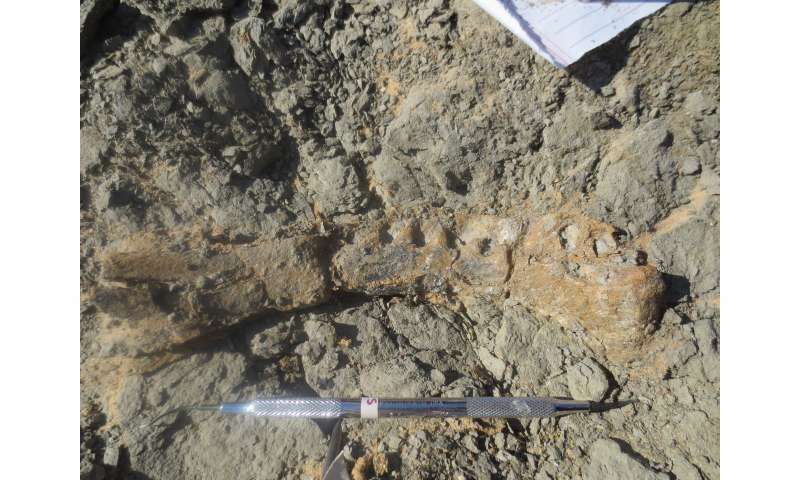 It was thrilling for my students to uncover bone after bone, as each new element we recovered helped to reveal who this giant dinosaur was." "Mansourasaurus shahinae is a key new dinosaur species, and a critical discovery for Egyptian and African paleontology," says Dr. Eric Gorscak, a postdoctoral research scientist at The Field Museum and a contributing author on the study. Gorscak, who began work on the project as a doctoral student at Ohio University, where his research focused on African dinosaurs, adds, "Africa remains a giant question mark in terms of land-dwelling animals at the end of the Age of Dinosaurs. Mansourasaurus helps us address longstanding questions about Africa's fossil record and paleobiology—what animals were living there, and to what other species were these animals most closely related?" Late Cretaceous dinosaur fossils in Africa are hard to come by—much of the land where their fossils might be found is covered in lush vegetation, rather than the exposed rock of dinosaur treasure troves such as those in the Rocky Mountain region, the Gobi Desert, or Patagonia. The lack of a Late Cretaceous fossil record in Africa is frustrating for paleontologists since, at that time, the continents were undergoing massive geological and geographic changes. During the earlier years of the dinosaurs, throughout much of the Triassic and Jurassic periods, all the continents were joined together as the supercontinent of Pangaea. During the Cretaceous Period, however, the continents began splitting apart and shifting towards the configuration we see today. Historically, it hasn't been clear how well-connected Africa was to other Southern Hemisphere landmasses and Europe during this time—to what degree Africa's animals may have been cut off from their neighbors and evolving on their own separate tracks. Mansourasaurus, as one of the few African dinosaurs known from this time period, helps to answer that question. 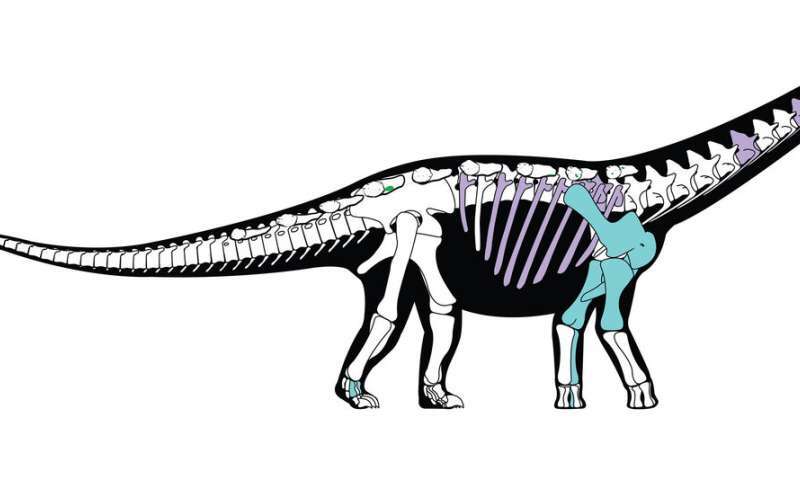 By analyzing features of its bones, Sallam and his team determined that Mansourasaurus is more closely related to dinosaurs from Europe and Asia than it is to those found farther south in Africa or in South America. This, in turn, shows that at least some dinosaurs could move between Africa and Europe near the end of these animals' reign. "Africa's last dinosaurs weren't completely isolated, contrary to what some have proposed in the past," says Gorscak. "There were still connections to Europe." Mansourasaurus belongs to the Titanosauria, a group of sauropods (long-necked plant-eating dinosaurs) that were common throughout much of the world during the Cretaceous. Titanosaurs are famous for including the largest land animals known to science, such as Argentinosaurus, Dreadnoughtus, and Patagotitan. 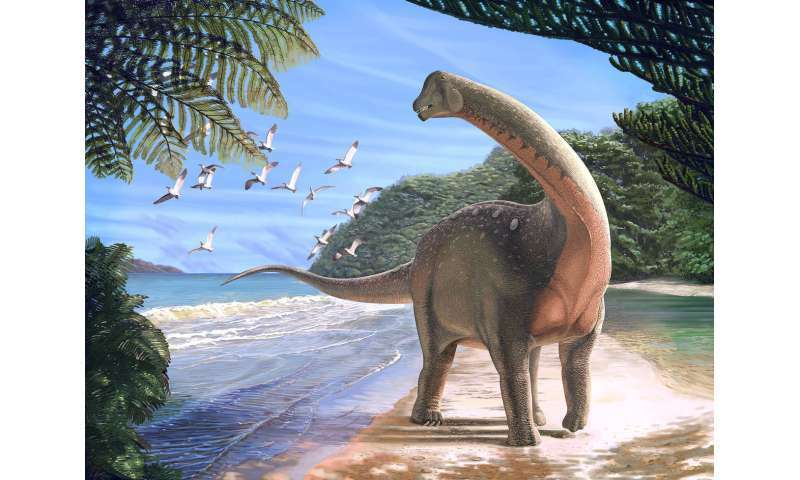 Mansourasaurus, however, was moderate-sized for a titanosaur, roughly the weight of an African bull elephant. Its skeleton is important in being the most complete dinosaur specimen so far discovered from the end of the Cretaceous in Africa, preserving parts of the skull, the lower jaw, neck and back vertebrae, ribs, most of the shoulder and forelimb, part of the hind foot, and pieces of dermal plates. Says study coauthor and dinosaur paleontologist Dr. Matt Lamanna of Carnegie Museum of Natural History, "When I first saw pics of the fossils, my jaw hit the floor. This was the Holy Grail—a well-preserved dinosaur from the end of the Age of Dinosaurs in Africa—that we paleontologists had been searching for for a long, long time." Also contributing to the Mansourasaurus research were experts on African paleontology from other institutions in Egypt and the US. MUVP student Iman El-Dawoudi played a particularly important role in the analysis of the new titanosaur, making numerous observations on its skeleton. "The combined effort of multiple institutions across the globe, not to mention the absolutely key role played by students on the project from the field, to the laboratory, to the final analysis and writeup of the results, exemplifies the collaborative nature of expeditionary sciences today," notes Dr. Patrick O'Connor, study coauthor and professor of anatomy at the Ohio University Heritage College of Osteopathic Medicine. "The discovery of rare fossils like this sauropod dinosaur helps us understand how creatures moved across continents, and gives us a greater understanding of the evolutionary history of organisms in this region," says Dena Smith, a program director in NSF's Division of Earth Sciences, which partially funded the laboratory portion of the research. Scientific discoveries are often compared to finding the last missing puzzle piece to complete a picture; Gorscak says that since so little is known about African dinosaurs, Mansourasaurus is better likened to an earlier step in the puzzle-solving process. "It's like finding an edge piece that you use to help figure out what the picture is, that you can build from. Maybe even a corner piece." "What's exciting is that our team is just getting started. Now that we have a group of well-trained vertebrate paleontologists here in Egypt, with easy access to important fossil sites, we expect the pace of discovery to accelerate in the years to come," says Sallam. Why did the elder dryas grow so much larger than the younger dryas? ,and there is only a layer of iridium, platinum, vitrification,...between? Why did they recently find dino bones with skin and feathers intact in China? ,and the recent finds in Canada? , and why were red blood cells found in many bones, over twenty-five years ago? Why is there an entire city buried beneath limestone, melt rock on the Yucatan, above what is known to be Chicxulub "crater"? ...is this the same limestone to form the Ozarks? ...and was it ejected from beneath the Mediterranean?, along with the ejecta blanket, which reached temps upward of 2200*C? Would any form of life be able to exist beneath the YDB strewn field, which covered a good portion of over four continents? Why does every single mountainous anomaly have the same westerly projection, all emanating out from the Mediterranean? Why do all the megalithic structures end abruptly and much smaller stones become the norm? Why are dino bones more porous? ...was there less gravity during the Pleistocene? Why are dino bones radiated? ...could it be from the heat of the YDB ejecta blanket? Why was the north American continent so devoid of life [horses?, pigs?,...]? Why was it considered to be "the new world"? Why does every single tectonic interaction reverberate out from the Mediterranean? What forced the Indian plate into Eurasia? Why do so many mountains line up between the Americas &Africa, Europe? Why is the scraping and scarring across the Atlantic still so clearly visible if it drifted over millions of years? Why did all the megafauna and megaflora disappear at this same moment, at the YDB? Why are there so many historical accounts of people living much longer and growing much bigger? Why is there so much obvious misunderstood technology, in everyone's face? Did the Moon impact this planet 13kya at the YDB? ...could it be that, when the Moon impacted 13kya, it slowed the lithosphere, outer plates and mantle further, in relation to the faster spinning, crystalized inner core?, would this have increased electromagnetism, gravity and the length of the day?, also increasing ground-level radiation? ...would this have made it impossible for the megafauna to exist? ...having developed genetic coding in lesser gravity? ...is the Moon the crystalized iron, inner core of a once habitable planet? ...has it impacted this planet on a somewhat regular basis? would a planetary imbalance produce excessive wobble on axis, allowing such an event?